Medibands save lives. Worry Less Live More! 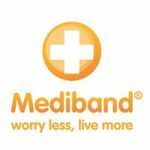 Mediband bracelets enable medical practitioners, paramedics, emergency workers and even colleagues, family and friends to quickly identify if a person has an existing medical condition, specific allergy or drug intolerance in order to administer the correct treatment.